Vacation! Ah, that time away from home when you can forget about the cares of the workaday world. Or, at least, it used to be. Now, I spend hours looking at the rack of vaping gear wondering what I should take. I want to take top-fill tanks so it's faster to fill 'em up. I want to take mods that offer reliable internal charging or feature internal batteries so I don't have to tote a charger and boxes of 18650s. I want to pack devices small enough that I can comfortably use while driving, aren't obnoxious when out in public, and won't fog The Wife out of the car. I also want to take a dripper or two with a nice build so I can chuck when I feel like it (and when it's appropriate), or sample e-liquids. Since I don't often use coil heads, I am taking several pre-built RTAs, but they're mostly hybrid tanks that WILL accept coils in case I get stuck and need something. But I'm also taking my travel build kit. Then, there's the e-liquid! My ADV is a nice coffee flavor, but I am not adverse to yogurts, custards, desserts, fruits, and cereals. I should probably take one of each. I don't have one of each, though, as I just finished off my yogurt. Hmmm? That might necessitate a stop at a vape shop on the way. I think I'll just take ALL of my 70/75 watt mods. Yeah... the ElE P70, the Athena eNVy 22, the Vaporesso Target 75TC, the eVic VTC Mini, the Sigelei 75, and the Innokin Coolfire IV Plus Storm if it arrives in time. That'll give me a chance to get to know and compare them. I have the Crown with RBA, the Delta II with RBA (not a top fill, but rock solid), the Target tank, with RBA, of course (also not top fill, but I got to get used to it), the Bellus, the Crius, and an eGo ONE Mega (with several prebuilt CLR heads). For RDAs, I think I'll pack the Mutation X V4 (it's white and will look real nice on the white Target), and the Phenotype-L (it's black and looks real nice on the black eVic VTC Mini). 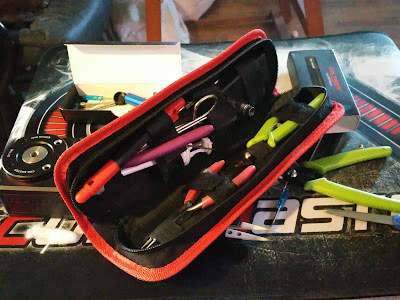 My travel build kit contains a double ended screwdriver, a set of ceramic tweezers, scissors, a magnet and brush combo (long story...), a pair of flush cuts, a pair of round nose jewelry pliers, a jig stick, a cotton pick, and an ohm reader. I keep it all in a zippered case that came with my set of precision pliers. For builds while on the road, I take a spool of Ni200, a spools of 26 and 28 gauge Kanthal A1. I'll also pack a powerstrip loaded with USB chargers. All of this, along with my iPad, will be tucked into a laptop messenger bag. When I get back, I'll have had a full, on-the-go week with the newly arrived Vaporesso and I'll write and record a review for that one. Just a note, though, before I go... I won the Vaporesso in an contest sponsored by Heaven Gifts on the ECF. It arrived last week, but the device was DOA. All I can figure is that the 510 positive was damaged in shipping. Even though it was a win, I contacted Heaven Gifts, and in less time that it is taking me to write this post and record the accompanying video, Heaven Gifts customer service had a new mod in the mail to me. It arrived today - less than a week since the original arrived - and, thus far, is working like a champ! THAT, friends and neighbors, is customer service! What do you think? Overkill for a week away from home? I look forward to reading your suggestions and thoughts. Sitting here chuckling to myself.